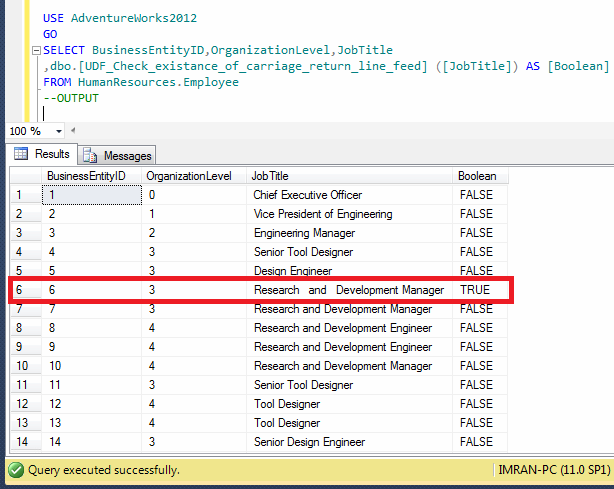 SQL SERVER – How to check if data has carriage return and line feed? I received this query from one of my consultants, when he was busy migrating legacy data for one of our customers, enquiring how to check if some of the employee job titles have carriage return and line feed? Whether there is any solution I can provide to check in any string that it has carriage return and line feed or not. This is the first time, I came across this query so I started searching the solution, but could not get a proper solution. So I started developing the solution. Given below is the script. In this example, I manually inserted a carriage return and line feed in employee table to test the above solution using given below script. Lets browse the employee table using above solution and check. Given below is the script.